Are you wondering how to save money for retirement? Some will recommend price trackers, others will tell you what expenses to cut down, and quite a few will focus on how you should invest your money. Although all these ways to save money for retirement are very valuable by themselves, I believe your success will depend on your ability to combine several solutions. That is why I’ve put together a list of eleven effective ways to save money for your retirement. In the following lines, you’ll learn how to pay less and earn rewards on your purchases, how to manage your finances better and make money. There is one thing I need you to keep in mind: these are not alternative solutions and you’re not supposed to choose the one or two you’re more comfortable with. Also, there is no right age for starting. Some start looking into the best ways to save money for retirement at 30 while others start worrying about their retirement at 40 or 50. If you really want to save money for retirement, you should not let your age influence your actions. You should use all the solutions recommended below at the same time. You can never have too much money when you retire; save money now, while you can still work and make money. This way, you will be able to age in comfort later and, why not, travel around the world and afford any experiences you’ve always wanted to enjoy and never got to it. Would you like to make more money? Check out this list of 100+ recommendations that could help you! You’re probably wondering how having good credit can help you save money for retirement. It can’t do it directly, but it can impact many aspects of your life. Landlords check credit scores to rent you an apartment, most employers won’t give you your without checking it, and don’t even think about applying for a rewards credit card without excellent credit. Having great credit score can help you save money on rent, get your dream job, and get better terms and conditions on your credit card, mortgage, and other types of loans you may be interested in. The first step towards improving your credit score is finding out where you stand. Credit Sesame or Credit Karma can help you do that. Sign up with Credit Sesame and start monitoring your credit score now! They let you check and monitor your credit score for free and they also help you find and qualify for the best credit cards for your needs. If you have poor or bad credit, you will need to improve it. One of the best ways to do that is to get a small loan or credit card and pay it off on time. BadCreditLoans can help you find the most convenient loan offers. Just don’t borrow more than you need, and make timely payments. Click here to connect with fast cash lenders and get the money you need fast! A great portion of your income goes to your bills: electricity, gas, water, rent, phone, and more. That is why saving money on your utility bills could be one of the most effective ways to save money for retirement. BillHunters can help you. They will negotiate lower bills for you and charge you a percentage of the savings they bring about. Click here to get help negotiating lower utility bills and start to save money for retirement! Speaking of bills, did you know you can get paid to save money on your electricity bills? It’s an app called Arcadia Power that aims to discourage energy waste and rewards users for saving energy. Click here to sign up for Arcadia Power and start getting paid to save electricity! If you pay rent, perhaps you qualify for a rent assistance program or you can find a property that is more affordable and offers increased comfort. Check out our post on how to get help with rent here! Also, do not neglect the importance of insuring your goods. It may seem like an unnecessary expense, but imagine how much money you would lose in case of a fire, flood, hurricane, or robbery. If you know where to look, you can get renters’ insurance from as little as $5/month. Follow this link to read our in-depth review of Lemonade renters’ insurance! If you use them right, credit cards can be a great tool to pay for stuff you otherwise couldn’t afford and get valuable rewards. If you feel you don’t have access to the best credit card perks available, you should consider paying off some of your credit cards and applying for new ones. To identify the best offers available and compare them, we recommend Creditcards.com. They let you keep track of the best credit card offers and compare them, so as to choose the best one for your needs. Click here to start using CreditCards.com and find the best credit card for you! You’re not going to drive across town to buy cheaper bread or milk, but it might be worth doing it for items you can buy in bulk, for cheap designer clothes, household goods, and more. There are tools that can help you search several stores for the items you need and compare their prices, like ShopSavvy or BuyVia. There are also websites, like Butterfly Saves and Honey that let you find not only the best deals available but also coupons and discount codes to apply and lower the prices even more. They even let you set alerts and receive notifications when the price of the products you’re interested in drops or new coupons become available. Click here to sign up with Butterfly Saves and get 50% off coupon codes for Target, Kohl’s, Macy’s, NordstromRack, Walgreens, Lowes, and more, along with best price tracker notifications! If you’re still wondering how to save money for retirement, this solution should give you a little more confidence. No matter if you do your shopping online or in brick-and-mortar stores, with the right app on your smartphone or an account on the right website, you can earn back a percentage of your purchases as cashback. The percentage can go as high as 20%. That means you could save $20 for your retirement with every $100 you spend. Ebates is one of the best money back app for online shopping. If you follow this link to create an account and you spend $25 through Ebates, you get a $10 bonus. If you prefer brick and mortar shopping, Drop is the best cash back app. These will help you get money back shopping at your favorite local stores for everyday stuff like groceries, household items, clothes, and more. Sign up for Ibotta through our link to get a $10 bonus and start earning cashback right now! Have you heard of the new app Shopkick? It literally pays you to walk into stores! You don’t even have to buy anything — you will get paid simply for entering stores! Of course, you will earn more points for actually making a purchase, but even if you’re just window shopping, you can still earn points. Click here to read our full Shopkick review so you know what to expect! Do you drive? Then you’ll want to use GetUpside when you fill up your tank, to earn cashback for the money you spend on gas. If you don’t drive, Uber is a comfortable and affordable alternative to taxicabs and especially public transportation. Not only that you can save $1 on every trip with Uber by using Ibotta, but you can join Uber as a driver and start earning money on your own schedule. Not only that you’ve learned how to save money for retirement, but you have an easy solution to earn more money for all your other expenses or plans. Click here to register and start driving with Uber! You probably keep track of your earnings and expenses, and you may think that using a best-buy price tracker is enough to help you make sure you don’t spend more than you need to and you save money for retirement. Well, it isn’t. Your money goes on many things you don’t really need and could be planned and distributed better. You’ll see that for yourself if you start using Personal Capital. It is a free app that will change the way you manage your finances, letting you track your income, expenses, liabilities, assets, and net worth in real time. It will help you assess your ability to stay within budget, monitor your investments, and your financial evolution, all from your phone. With it, you’ll come up with your own ideas and solutions on how to save money for retirement. Click here to create your Personal Capital account and take control of your finances! Just the fact that you’re reading this post tells me that you’re not making enough money. I can help you change that. There are many things you can do, but the best solution to start is to educate yourself. Just as you started looking for advice on how to save money for retirement, you should start gathering information on how to earn more money. If you like reading books, we’ve already put together a list of 15 personal finance books that should help you. Then, you can look into our 100+ money-making ideas here. Start using money making apps. We’ve compiled a list of apps that pay real money here. You can get paid to play Trivia and slots, to lose weight or just walk. Check out Swagbucks Live, HealthyWage, Sweatcoin, Long Game, InboxDollars, etc. Drive with Uber. If you have a car and a couple of hours a day, you can register as an Uber driver and make money even as you run your errands. Become an Airbnb host. If you have an extra room in your home, or, better yet, a house or apartment you’re not using, you could host guests there and earn big money. If you don’t, you can still use Airbnb to find accommodation during your trips. Rent out your car. If you have a car you’re not using, you can rent it to others with Turo. You won’t have to worry about damage, theft, or collisions, as it would benefit from huge insurance coverage. Get into dropshipping or affiliate marketing. Both activities require a website, but, as this comparison reveals, the first one means curating and promoting third-party products and services, ordering them, and having them sent to your client, while affiliate marketing means generating sales or leads to third-parties. Start a blog and monetize it. If you like reading, writing, and telling stories, this could be a great money-making idea. This guide can help you put it into practice. Create digital products and sell them. You could write a book, create a video course, photos collections, or anything you can think of in a digital form and sell it. This guide will teach you everything you need to know. There are many more things you can do to earn more money. Some of them do not even require time and effort from your side. Follow this link for 31 passive income ideas and learn how to earn money even while you sleep! Now you know how to earn and save money for your retirement but what do you do with that money? You can let it linger in your 401k or IRA account or you can invest it and make even more money. Personally, I prefer and recommend the second option, especially since there are now investment apps that eliminate the risks and the guesswork and are extremely easy to use. Start with low amounts to keep risks low until you make sure you know exactly what you’re getting into. With time, you will identify the easiest to use and more profitable apps and develop your own winning formula. Unfortunately for you and luckily for our country, you will have to pay taxes on the money you make. This brings us to the last point of our guide on how to save money for retirement – managing your taxes. As a taxpayer, you have to declare your earnings and pay taxes every year. The procedure depends on how you earn your money (e.g. employee or self-employed). The government’s obvious goal is to take as much money as possible from you, while still leaving you a few solutions to deduct your expenses and stay productive. Therefore, you should not expect the tax-filing process to be easy if you plan on going through it by yourself. A much better approach is to work with a CPA or, at least, use a tax management app like Hurdlr. While working with a CPA will obviously cost you, Hurdlr does have a free version you can try. If it’s not enough for your needs, it will at least give you a taste of how the app works and help you decide if it’s worth paying for. You can expect it to help you keep track of your earnings and expenses, help you benefit from all available tax deductions, save money on taxes, ease the filing process, and get the largest tax refund possible. To find out more about Hurdlr, read our in-depth review here! I realize all the above information can be a little overwhelming, especially if you’re not used to apps or a huge fan of online shopping. 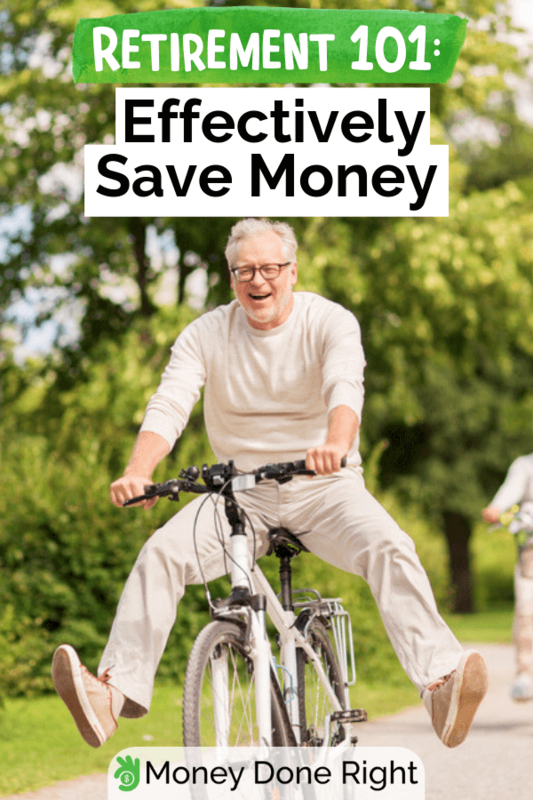 Also, some of the ways to save money for retirement presented above may not seem like a huge deal, since they bring you only small amounts at a time. However, if you give them a chance, you’ll see they are incredibly convenient and accessible. Shopping through a best-buy price tracker may take a couple of seconds but will help you make sure you get the best deal. Once you’ve had a money-back shopping app installed, it will work for you in the background. You may save only cents or a couple of dollars on every shopping session, but that’s money you take, not give. Moreover, you can put that money to work and make even more with one of the above-recommended investment apps. Drop-by-drop, dollar-by-dollar, you will save the money you need to secure your future and peace of mind. You deserve a safe, comfortable future and getting rid of money-related worries, and my goal is to help you enjoy it. Start implementing the above advice on how to save money for retirement right now. As you do it, don’t hesitate to share your experience, your progress, and your own recommendations in a comment below!